When designing luxury bathroom projects, we feel that it is the “level and quality of the finishing” that can make all of the difference to a high end look. Our attention to detail and expert creative designs, sets us apart from other general bathroom suppliers. Concepts design team work will always work with luxurious textures and latest materials, to ensure that your new luxury development or private client project is the highest quality and build that it can be. 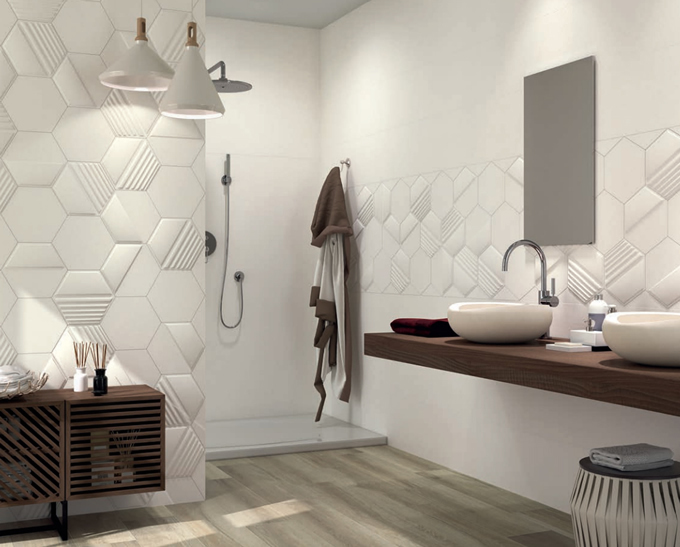 A creative way to uplift and detail your new project, is through the use of beautiful tile colours and texturers, that can add a unique detail to a bathroom. These high end feature tiles make an excellent accent wall and paired with a slate coloured sit on vanity bowls, this can draw the eye and make a statement in an otherwise neutral, peaceful bathroom. 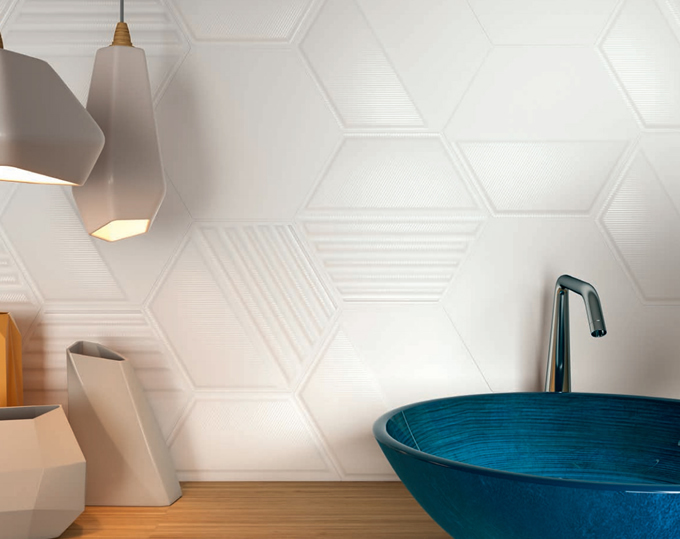 Similarly, these geometric tiles can be used to add texture and dimension to a tiled wall in a neutral toned bathroom, to promote relaxation and tranquility. Or alternatively they could be used very subtly to enhance a timeless accent wall, as a back drop for a statement sit on vanity bowl . 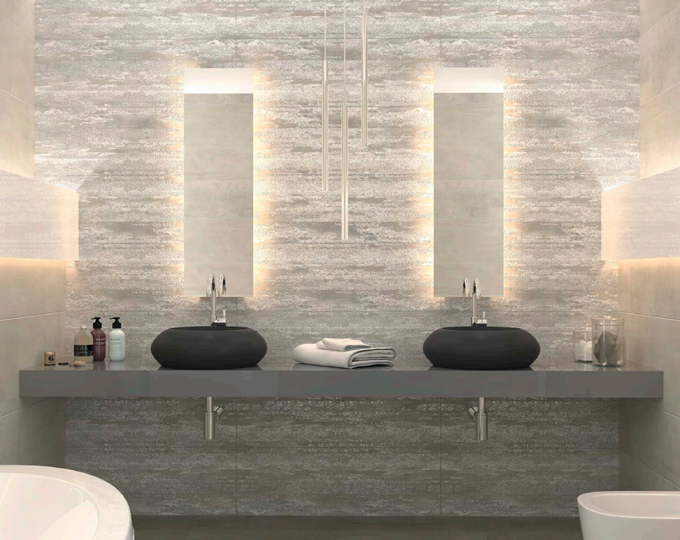 High-end bathroom tiles are a perfect way to stylise luxury developments or private client projects, if you would like to know more about our range of high-end tiles, we have the latest selection of high-end and accent tiles in our specialist bathroom and tile studio. Our in house design team are available to meet you for a design consultation, to help with the initial design concept of your project before the the actual building has commenced. This ensures that the optimum layout and very best bathroom designs are created and realised . This entry was posted in Luxury Bathrooms and tagged Bathroom Tiles Ascot, Bathroom Tiles for Designers, Bathroom Tiles Maidenhead, Décor Bathroom Tiles, Designer Bathroom Tiles, Feature Bathroom Tiles, High-end Bathroom, High-end bathroom tiles, luxury bathrooms. Bookmark the permalink.